Heat oil in a pan and then put cat fish to fry in a pan until it change to golden. Serve to a dish with vegetable. 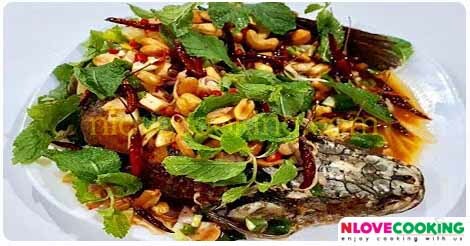 Make a sauce by put lime juice, fish sauce, shallot, lemongrass, parsley, coriander leaves, cubed lemon and chili. Stir it to combine together. 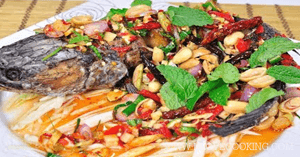 Put the sauce to a fried fish dish.